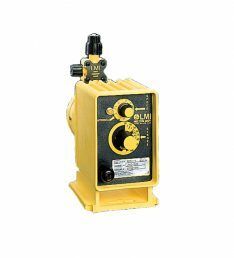 The LMI J5 Series Metering Pump – 12 Volt DC – 0.006 to 2.0 GPH, is designed for remote applications where AC electrical power is unavailable. Its low power consumption makes it ideal for agricultural and solar powered installations. LMI Pump Features 12 VDC power for remote applications where AC electrical power is unavailable, Low power consumption (1.6 amp average current draw or 19 watts at maximum speed), Manual or external control for flow proportional applications, UL, CUL, NSF 50, NSF 61, CE Certifications. Options include: Four Function Valve, AUTOPRIME™ liquid End, Low Level Float Switch, Digi-Pulse Flow Monitor, Repair & Preventive Maintenance Kits and Calibration Columns.